A floor scrubber has delicate components, so you’ll need to follow a few steps in order to keep your machine in optimum condition. Before you implement any advanced procedures, carefully read the owner’s manual for your unit. The booklet should have a chapter that addresses the maintenance requirements that are specifically designed for the machine. The brushes underneath a floor scrubber will attract debris like a magnet, so you must clean the bristles regularly. If a lot of dirt covers the brushes, the machine may malfunction over time. Debris, dirt, and lint will build up on the squeegee if you don’t clean the surfaces often. When your squeegee is extremely dirty, you’ll see unsightly lines after the machine glides over the floor. The battery in a quality automatic floor scrubber should be inspected several times a month. When your battery begins to fail, you can give it more juice by filling the port with distilled water during the charging cycle. You must monitor the water level at all times. If the water flows out of the battery, the acid will ruin your flooring. You’ll need to rub oil on the joints regularly so that the machine will operate smoothly. You can determine which type of oil the machine uses by reading the maintenance section in the owner’s manual. If your business facility is small, you may want to buy a unit that has an on-board charger and an advanced breaking system. 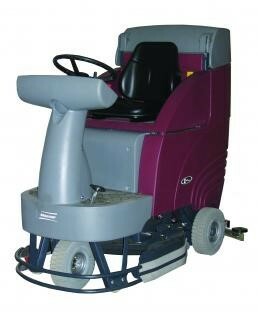 Most commercial floor cleaning machines manufactured with these features also have the ability to rotate 360 degrees. To efficiently clean a typical facility, you’ll need a machine that has a 27-gallon tank and a removable debris box. Floor scrubbers that are specifically designed for average cleaning projects will have a control panel and a variable solution flow rate. If you’re shopping for an innovative machine, many manufacturers are now building units with interchangeable scrub decks and a low-battery indicator light. These units are great investments because they are made out of a heavy-duty steel material. Units that have a 30-gallon tank, on the other hand, are ideal for large business facilities. These machines are built with a parabolic squeegee, which absorbs water quickly and efficiently.